It is not my usual choice to go for acid etching rather than electro etching, but this time it was a perfect technique for a job. I have been commissioned to make silver wedding bands featuring old Viking writing in the design. 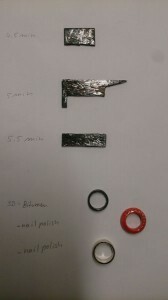 I have originally tried to achieve following results with electro etching, but unfortunately due to insufficient contact point between the ring and anode it didn’t work out. 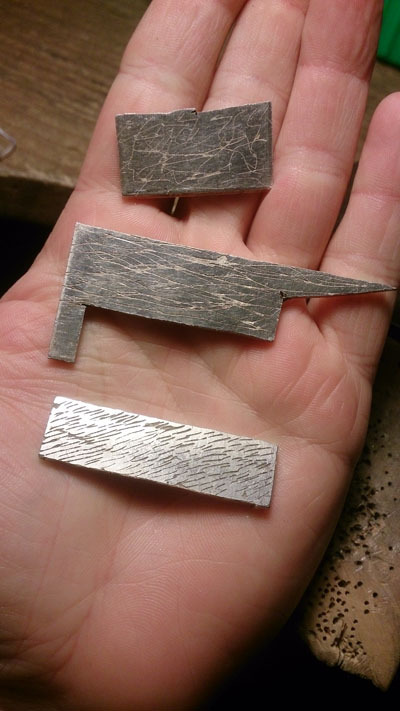 Acid etching technique is not unusual in metal work, has got long history and lots of artists use it. Different metals require different acid to be used; nonetheless all of them are pretty dangerous. I personally resent using strong acids as they can be very harmful to one’s health and environment. 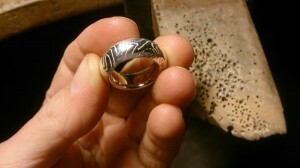 For sterling silver it is nitric acid that is most effective. I used 1:3 ratio (1 part nitric acid and 3 parts water) – always be sure to follow correct mixing procedure; pour water into suitable container first and then acid! 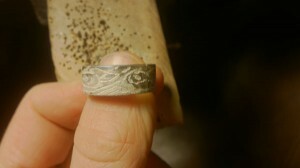 Metal to be etched also needs specific preparation. First of all it needs to be well cleaned. It is good idea to wash it in warm soapy water and rub it with scoch brite sponge (it will give it bit of roughness for resist to grip on) first and then clean it with acetone. 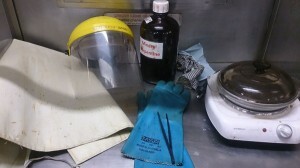 Handle the metal in silicon gloves so you don’t contaminate it again with finger oils. Resist (coating protecting metal from acid exposure) applied to a metal is chosen based on design and effect that we desire. 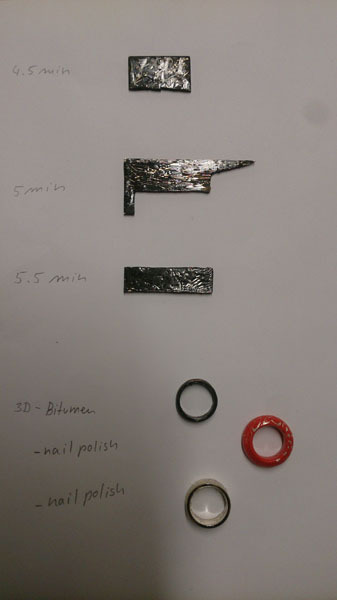 Most common resists available are: waterproof duct tape, some permanent markers, wax, nail polish and bitumen paint. I like to use bitumen paint as it doesn’t peal off in the bath; however, for sampling I have also tried two different nail polishes. Bitumen paint is also most appropriate resist for me to use as the design on rings to be etched is scratched in to the resist rather than painted on. Bitumen paint has worked for me this way well in past. 1 – read MSDS (even if you have red it before and you know what stuff you are dealing with it is good idea to read it again…..it is like going on airplane and reading the safety handbook every single time you get on). You really don’t want to get any amount of nitric acid on your skin, in your eyes or inhale it! 2 – prepare all the PPE and other equipment needed (safety goggles, safety face shield, fume mask, liquid protective apron, bi carb soda for neutralizing, feather for removal of bubbles, pirax dish with lid, another dish for fresh water, mineral turpentine and acetone for removal of resist, heavy duty rubber glows, plastic tweezers, appropriate container for disposal of the used acid bath) in well-ventilated area. 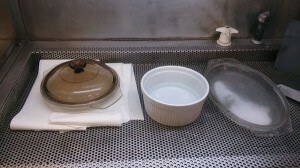 3 – prepare your samples chart (it is good idea to make some samples first to test out different time exposure to the acid bath – journaling is handy habit). 4 – put on all the PPE, get ready a timer and start etching. I have etched my samples at times: 4.5, 5 and 5.5min. 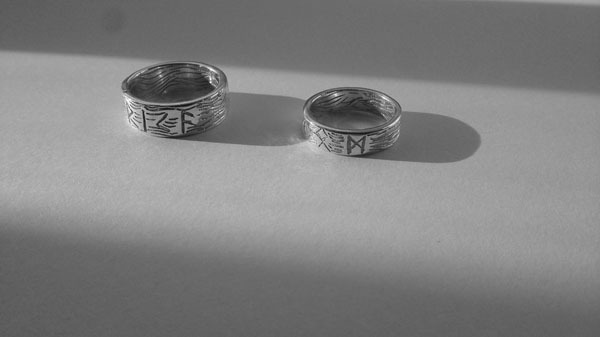 The bite was pretty good on all of them, but I felt that for rings that will be worn everyday it is important to that it is deep so the design wouldn’t ware of. 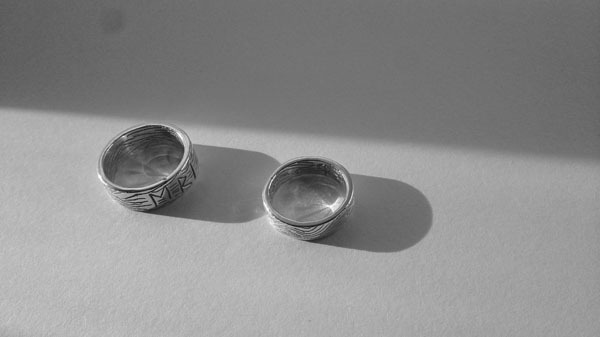 Therefore, I have decided to etch rings for 5.5min. Note, nailpolish resist samples have proven, that the resist is definitely not as good as bitumen paint. Interestingly, it also seems to be big difference in brand of the nailpolish used. The clear nailpolish has peeled off in bath significantly…ruining the whole sample ring. Note; during the etching process bubbles will be forming around the metal, those needs to be gently swept away by larger feather, cotton cloth or strings (if feather is not available). 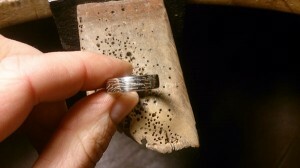 Leaving bubbles to form on the etched metal would result in consistent etching. 6 – when etching time is up remove the metal from the acid bath and place it in to a bath of water with bi carb soda to neutralize any acid residue than rinse it in fresh water. Pour carefully acid bath into appropriate container and prepare for safe acid disposal. 7 – to remove bitumen paint from the metal use mineral turpentine and to remove nailpolish use acetone. 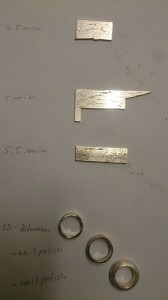 This etching process is relatively fast as it takes only about 5 min for acid to etch the metal. Yet it is quiet lengthy due to time it takes to set up safely and clean up after.